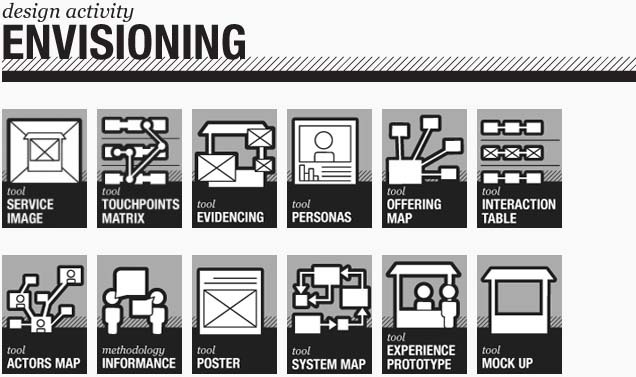 Cool idea: observe the processes used in the design of services, products, and communications, gather them in one place, illustrate and annotate them, and then offer case studies showing how they are used. It’s more than cool. It’s brilliant. The work began as research done by Roberta Tassi for her graduation thesis. The end result is a comprehensive and easy-to-understand catalog of tools used in design processes that deal with complex systems. I’m struck that all the tools explained are—in one way or another—communication tools. Service Design Tools has been conceived of as an open platform of knowledge, and it is freely shared with the design research community. Thanks to friend and colleague Michelle Fonzo for the reference. this is still the state of affairs in a few years time!